The man who leaked details of U.S. government surveillance programs is seeking asylum in Ecuador with the aid of WikiLeaks. The man who leaked details of U.S. government surveillance programs was seeking asylum in Ecuador with the aid of WikiLeaks, the organization and Ecuador's Foreign Ministry announced, according to CNN. Edward Snowden, the onetime contract analyst for the National Security Agency (NSA), left Hong Kong after the U.S. government sought his extradition on espionage charges, WikiLeaks said. He landed in Moscow, where a CNN crew spotted a car with diplomatic plates and an Ecuadorian flag at the Russian capital's international airport. WikiLeaks, which facilitates the publication of classified information, did not disclose what country would be Snowden's final destination. But Ecuador has already given WikiLeaks founder Julian Assange refuge in its embassy in London for a year after he unsuccessfully fought extradition to Sweden in British courts. Washington is asking Ecuador, as well as Cuba and Venezuela, not to admit Snowden, a senior Obama administration official told CNN on Sunday. The United States also is asking those countries to expel him if they do admit him, the official said, and a source familiar with the matter told CNN that the U.S. government has revoked Snowden's passport. State Department spokeswoman Jen Psaki said it was routine to revoke the passports of people charged with felonies. She would not comment specifically on the status of Snowden's passport, but said, "Persons wanted on felony charges, such as Mr. Snowden, should not be allowed to proceed in any further international travel, other than is necessary to return him to the United States." Snowden "left Hong Kong legally" and is headed to Ecuador "via a safe route for the purposes of asylum," WikiLeaks said in a statement issued Sunday afternoon and quoted by CNN. He is accompanied by diplomats and lawyers for WikiLeaks, including former Spanish judge Baltasar Garzon, according to a statement from the organization. "The WikiLeaks legal team and I are interested in preserving Mr. Snowden's rights and protecting him as a person," said Garzon, who also represents Assange. "What is being done to Mr. Snowden and to Mr. Julian Assange -- for making or facilitating disclosures in the public interest -- is an assault against the people." Assange fled to the Ecuadorian Embassy in London in June 2012 to avoid extradition to Sweden. Assange has repeatedly said the allegations are politically motivated and that he fears Sweden would transfer him to the United States. There are no charges pending against Assange in the United States, but Bradley Manning, a U.S. Army private who military prosecutors say leaked a vast cache of classified documents to WikiLeaks, is now being court-martialed on charges of aiding the enemy, and he faces life in prison if convicted. Snowden has admitted he was the source who leaked classified documents about the NSA's surveillance programs to the British newspaper the Guardian and to The Washington Post. The documents revealed the existence of programs that collect records of domestic telephone calls in the United States and monitor the Internet activity of overseas residents. The revelation of the leaks rocked the Obama administration and U.S. intelligence community, raising questions about secret operations of the NSA and whether the agency was infringing on American civil liberties. Snowden told the Guardian that he exposed the surveillance programs because they posed a threat to democracy, but administration officials said the programs are vital to preventing terrorist attacks and are overseen by all three branches of government. Snowden left Hong Kong on Sunday "through a lawful and normal channel," the government of the semi-autonomous Chinese territory said Sunday, according to CNN. 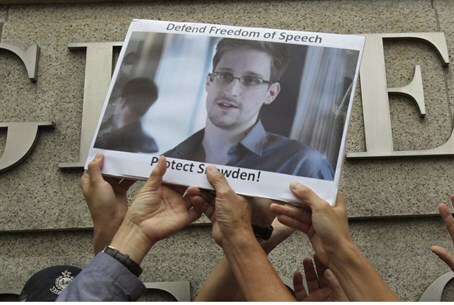 The U.S. government announced Friday that it was charging Snowden with espionage and theft of government property and asked Hong Kong authorities to hold him for extradition proceedings.